Carlisle midfielder Cameron Salkeld has today signed for Annan Athletic on loan until the end of the season. 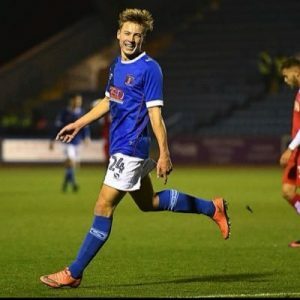 The 19 year old midfielder is a product of the youth system at Brunton Park and will go straight into the squad ahead of this weekends home match, subject to international clearance. Cameron spent two months of this season on-loan with Whitby Town and featured in Tuesday afternoon’s home reserve game victory over Fleetwood Town. He made his debut for United in October 2016 against Blackburn Rovers in the Checkatrade Trophy and scored his debut goal a month later in the same competition against Fleetwood.